Since I often share details of my nighttime skincare routine with you all on snapchat (@meganrunionmcr), I've had a lot of requests for a full skincare blog post. After testing out product after product in my early 20's, I've finally perfected my routine and become quite obsessed with it. Keep in mind that I have super dry skin, so a lot of these products (and the way I use them each night) won't be for every skin type. However, there's always a similar product that won't be quite as hydrating for all of you with oily skin (I'll link those below as well) that will serve as a great alternative or easily taken out of the routine all together. I promise, promise, promise if you invest in these products now and use them nightly for the next 30 days, you'll see a big difference in the overall quality of your skin. We all have things that we love to splurge on and for some of you, skincare may not be one of those things, but for me- taking care of my skin, body, + mind is everything. 1. Neutrogena Make Up Removal Wipes - I've literally used these wipes since middle school. They are my OG, tried and true, product for removing my make up. I don't feel like anything takes off my eyeliner, mascara, and foundation, better so I like to start here and then use a gentle cleanser. 2. Power Glow Peel - This is a product that has only been in my routine for the last six months or so, but I've become SO obsessed. My skin, especially in the Winter, gets so dry and flaky, so these wipes are literally magic. Each wipe is a mini facial in that it exfoliates and gets rid of that dry and dirty, top layer of skin, all while reducing fine lines and wrinkles. I started off using these 2-3 times a week until my skin was used to them, but now I use one every other night. If you have dry skin - these are a GAME changer. I'll never be able to go without them again! 3. Cleansing Foam - A gentle cleanser is a product that most everyone has in their routine. I personally love this one because I love the results I've seen from using La Mer, but any cleanser will work. It's just nice to get any dirt or leftover makeup off of your face before moisturizing and going to bed. 4. Toothbrush - After the wipes/cleansing and before moisturizing, it's always nice to let your face air out a bit. I usually use this time to brush and floss my teeth. Obviously I didn't list each product that I use in the graphic above, but for those interested, I use Crest 3D White Toothpaste and occasionally, the strips. 5. Moisturizer - This is my 'ALL the praise hands' product. I seriously can't live without this moisturizer. It has 100% changed my skin completely. I use the applicator that comes with the moisturizer (simply so that I don't have to put my fingers in the jar) and it only takes a tiny bit for your whole face, meaning this product will last you a long time. Some people prefer not to use this every night, but my skin is so dry, that I have to. Others who love La Mer, but don't have super dry skin, use the moisturizing soft cream as an alternative that still gives you amazing, glowing results. 6. Renewal Oil - I just started using this product about six months ago as well, and I absolutely love it. It literally just glides right over the top of your moisturizer (basically serves as a serum), giving your skin a beautiful, healthy glow. This product also only takes 3-4 drops to cover your entire skin/neck. I make sure to rub it in really well around my hairline and jawline, where fine lines tend to settle. When you wake up in the morning, your skin feels just as hydrated and nourished as when you put it on. In my opinion, this product is worth every penny. 7. NeuLASH - I literally started using this last night, so I can't exactly speak to how much I love it quite yet. However, I can tell you that it's super easy to apply and I've heard SUCH amazing things about it. Even reading through the reviews + looking at before and after photos, you can tell it actually works. I'm using it every night for the next 30 days (at least), so I'll be sure to let you know how it is! 8. Body Lotion - I picked up a HUGE bottle of this super hydrationg body lotion during the Nordstorm Sale a few months ago in hopes that I would love it and I absolutely do. I take baths at night, so after I dry off and before climbing in to bed, I have to hydrate my skin. This lotion doesn't have too much of an odor and is so moisturizing, especially for your legs. Even J will use some of this when throwing on shorts or when he has dry skin, so it's definitely something your guy can share, too! 9. Silk Pillow Case - It's been about a year since I got on the silk pillow case kick and I don't think I'll ever go back. This one is so good for your skin and hair, plus I love how cool to the touch it stays during the night. I've washed mine multiple times now and it has held up really well. If you're going to spend money and invest in great skincare, you might as well get your beauty sleep on something as luxurious as silk! I hope this has been helpful! Feel free to ask any questions you may have in the comment section below and I'm happy to answer them. I'll be sure to share any other products I try/love in the future with you all on my snapchat, so be sure to follow along, @meganrunionmcr! 3,5 and 6 are items I can't live without !! 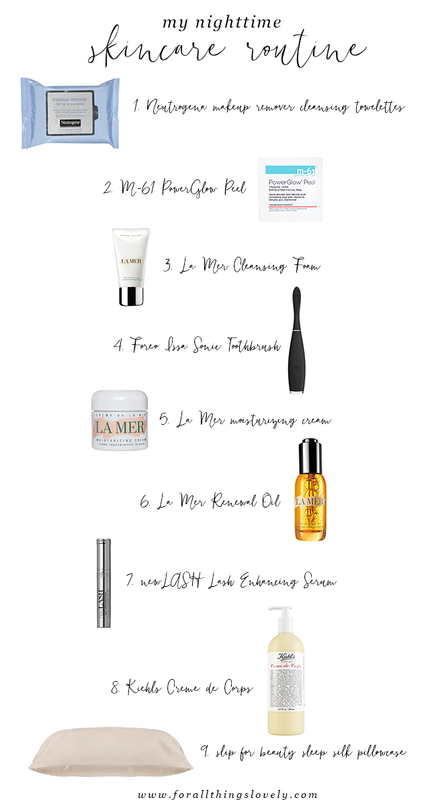 LaMer products are everything a woman would ever wish to have in her beauty bag. Quick question... is this in the order that you use them? Do you use the exfoliating wipes before the La Mer cleanser? Quick question... is this in the order you use the products? Do you use the exfoliating wipes before the LaMer cleanser? Love! I got the La Mer renewal oil as a sample from Nordstrom so I'm trying it now. I need to get that pillow case! I keep forgetting and you just reminded me! Ah I feel like I need to invest in La Mer! Everyone keeps saying such great things about it! Great tips Megan! I am new to La Mer but have looooved it so far! Hope you are having a great week! Team La Mer all the way!